An artist’s rendering of what will be called the Commonwealth Building. 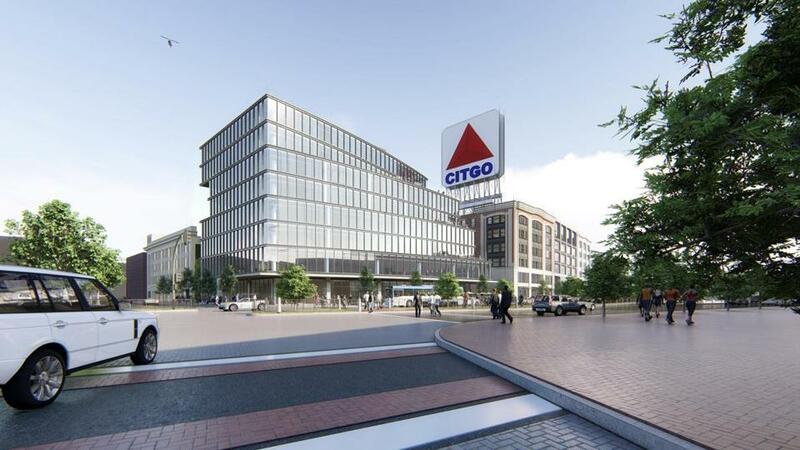 Office workers who end up on the top floors of a proposed Kenmore Square building would have up-close views of the Citgo sign — as in, real close. Renderings filed with the city on Wednesday by the owner of nine properties on Commonwealth Avenue and Beacon and Deerfield streets show a sleek, eight-story glass building with parts of the top floors facing the base of the landmark sign. The structure, to be known as the Commonwealth Building, would be one of two new office and retail buildings added to the block by Related Beal, the developer. The Commonwealth Building would replace the six-story structure on the corner of Commonwealth and Deerfield Street, which houses the City Convenience store, as well as two buildings that had housed the New England School of Photography and a Bertucci’s restaurant. Designed by Roger Ferris + Partners, a Connecticut architecture firm, the building will feature a stair-like design, with several floors set back in step-like fashion to ensure unobstructed views of the Citgo sign. The “steps” would also provide outdoor terrace space for office workers. According to the plans, the Commonwealth Building will include 130,000 square feet of office space and 10,000 square feet for retail businesses, as well as 60 underground parking spaces. The building on which the Citgo sign sits — currently home to a Barnes & Noble bookstore — will undergo extensive interior renovations and be attached to a new structure that will replace the property next door, which houses Cornwall’s pub. The Beacon Building, as that new structure is to be called, will incorporate more glass into its design, a marked change from the existing brick-heavy structures. Combined with the Citgo sign building, the newly joined structures would have a total 143,000 square feet, including more than 110,000 square feet of office space and 18,000 square feet for retail. The structure at 11 Deerfield St., which currently houses a post office, will undergo internal renovations, but there won’t be any additional changes to the building, Sweeney said. He said leases for the remaining tenants on the block all expire before year’s end. Related is working “with many of the existing tenants to find permanent space in the new project,” Sweeney said, including Barnes & Noble and Cornwall’s. Related paid $134 million for the nine buildings and in March 2017 reached a deal with Citgo to keep the sign in place “for decades to come.” Depending on the approval process, construction could start next year. reached at kconti@globe.com. Follow her on Twitter @GlobeKConti.